True to its reputation as the garden city of India Bangalore has some beautiful garden venues for your celebrations.This combined with its international feel and cosmopolitan appeal makes Bangalore a great wedding destination. Check out our top 5 garden wedding venues in Bangalore. Welcoming antique doorways lead you in to traditional courtyards, interwoven by cobble-stoned pathways. Elegant pavilions and panoramic beauty make you surrender to the charm of this magical garden. Two large kitchens, a very special Sheesh Mahal bar and ample food counter space, comfortably accommodate up to 1500 guests. The grand guest house and two villas can accommodate up to 25 guests. Engulfed in the midst of tropical gardens, the villas feature luxurious bedrooms, open to sky bathrooms, verandahs, outdoor seating, lotus pond courtyards, large water urns, a unique collection of art, antique furniture, and collectibles making it perfect your family gathering. 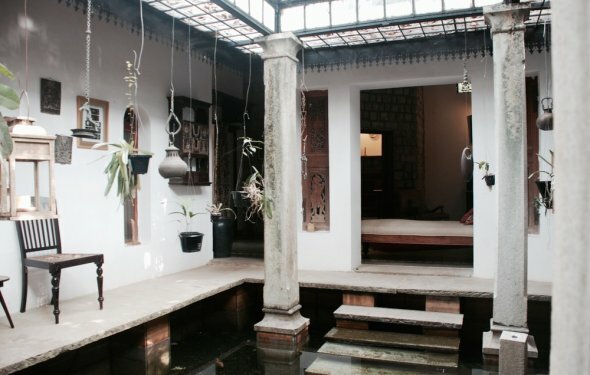 Bangalore’s only legendary hotel is an event space like none other in the world. The Taj West End has 20 acres of lush captivating gardens and graceful gathering spaces. Some of the most valuable heritage tress in the city can be found on the hotel property. So pervasive is the influence of the surrounding flora that all the residential blocks have been named after flowers. Guests can stay in the Gardenia, Magnolia, Frangipani and Lotus blocks, just to name a few. So treat your guests to one of the 117 rooms and suites. Each has a private balcony or verandah, luxurious bathroom, contemporary furniture and a vibrant colour scheme that emphasize the modern, yet warm, appeal of the interior. At The Taj West End, our favorite venue for a wedding is the Prince of Wales lawn, which is spread over 11, 000 sq.ft. Choose to hold an afternoon wedding celebration as the fabric themed decor transforms the gardens to a riot of tastefully crafted sunshades. Then move to an evening reception where one flick of a switch will transform the gardens to resemble a moonlit paradise. Host a smaller celebration for your special guests by the private pool at the Bridal Villa. Walk the aisle to the Bridal Villa through a host of butterflies sharing your celebrations. The uniquely designed Maharani’s Mandapa is floating on water and connected by a bridge to the mainland. Take your vows surrounded by water as you see a cascade of flowers falling down the slopes of the garden. While the eight luxuriously appointed rooms, give your wedding guests an experience to remember, the Bridal Villa with its temperature controlled pool and its own manicured garden, will make it a night to remember. The Oberoi Bangalore definitely lives up to its reputation of being an island of calm and green soothing beauty in the midst of all the noise and chaos of MG Road. All the tastefully appointed rooms have large balconies that overlook the beautiful gardens. Start your wedding celebrations with a romantic dinner at Rim Naam a beautiful alfresco restaurant nestled amongst rain trees, bamboo groves and tropical gardens. There can’t be a better location to spend an evening together dreaming of all the beautiful things to come. Host a pub style lunch at The Polo Club which stands out as a perfect reflection of the garden city! Offering breathtaking views of the garden. Celebrate your wedding/reception at the outdoor swimming pool amidst palm and frangipani trees. The Golden Palms Hotel & Spa is a 5 star property just outside Bangalore which is built in the rugged grandeur of the Moorish – Spanish casitas. Capturing the breath of fresh air with lush foliage, sprawling lawns, exquisite architecture and landscaping create an ambience that is perfect for your special day. The Hotel comprises of 150 rooms including suites and provides a range of facilities for its wedding guests including a Spa with 75, 000 square feet area, specialized restaurants and bars, a 135 meter lagoon shaped swimming pool and ball rooms which make great venues for weddings. Our personal favorite in the island in the middle of the swimming pool which makes for an amazing mantap. Contact us to plan your next celebration at these stylish and peaceful locations combined with excellent service, lovely rooms and the wonderful Bangalore weather that can make every celebration blissful.